Golden State Road Warriors on December 10-11 at Dreamcourts in Hayward. This is GSRW’s only home tournament this season. Please come out to see some great wheelchair basketball and root for Chuck, Trooper, Marcus and the rest of Road Warriors. See attached flier for address and schedule. Power Soccer in Berkeley December 3-4! BORP Power Soccer invites you to come to the Power Soccer games on December 3-4 at the James Kenney Recreation Center, 1720 8th Str. Berkeley. The FIPFA World Cup won by the USA Power Soccer Team on 11/6/11 will be on display and members of the USA team will be in attendance and competing with their home clubs. Please help spread the word (flier attached), come out and enjoy some great competition, and honor Team USA’s great accomplishment. Varsity Team takes 3rd in Regionals! I am so proud of our Varsity team for the effort they put out last weekend. 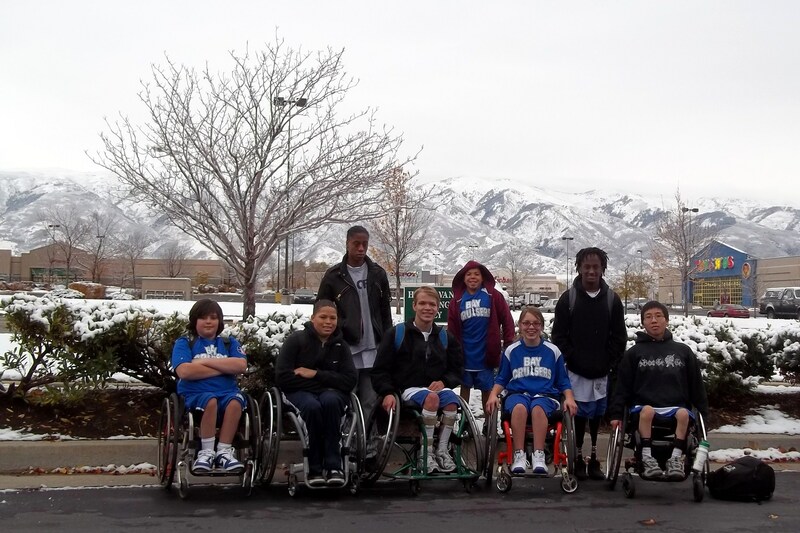 The Western Regional Tournament was held just outside Salt Lake City, UT and involved seven teams from the West Coast Conference. BORP started the tournament shorthanded with two starters not eligible to play for academic reasons (GET TO SCHOOL!!!). The rest of the team came together and gave everything they had. During the Friday night game against San Diego, it was obvious that the change in line-up had created a little difficulty for the team to adjust to. The team worked hard, but did not click as they usually do. As the game progressed the team started playing better and using team concepts but they had already fallen behind and wound up losing by 4 points. On Saturday, the official tournament began and the team opened the day facing Seattle. They worked amazingly well together and built a lead deep into the 2nd half. The smurf twins (Christie and Cortney) came off the bench to pick Seattle’s big guy from one end of the court to the other. Unfortunately, with about 10 minutes left in the game, the Christmas Elves came early and dropped a lid on the basket. They continued to work as a team and get wide open lay-ups, but they just wouldn’t fall. Seattle pulled back and took the lead, eventually winning by four. That loss dropped the Cruisers into the losers bracket of a double elimination tournament. With their backs against the wall, the team faced a tough Denver team. Denver has probably the top point guard in the country and was able to keep it a close game in the first half. In the second half, we switched things up and had Koda running the point. This gave James more opportunity to work away from the ball and they were able to run the court with picks from Christie, Cortney, and Zach. William and Reajean continued to set up off-side and get their shots once the team over committed to Koda and James. Working together, the Cruisers were able to advance to the next round. In the final game of the day the Cruisers met up with a determined Phoenix team. Phoenix had advanced over Seattle by coming from behind to tie their game with only 2 seconds left and winning the game in overtime. They were confident and energized and only one team could advance. The Cruisers jumped on them from the start. Zach was a picking machine and Koda and James ran the court. William and Raejean picked up the offside buckets when Phoenix could stop the transition, and Cortney and Christie continued to work on both sides of the court. BORP continued to pull away and post a 40 point victory. Saturday night finished with an All-Star game with players selected from each team. BORP was represented by James Bohnet, Koda Inman-Ahlstrom, and Zach Penick. All three players played incredibly well and represented their teammates great. The game wound up a tie and was a fitting end to a long day on the court. Sunday began with the rematch between BORP and San Diego. The Cruisers were ready to get even for the loss on Friday night and move further into the tournament. During the first half, San Diego worked hard to build a 10 point lead. With 5 minutes left, the Cruisers began reeling them in and were able to tie the game with 10 seconds left in the half. Unfortunately, the Cruisers could not break the press in the 2nd half and turnovers plagued the team. The defense played amazing and held San Diego to only 39 points. Unfortunately the Cruisers could only get 30 points on the board themselves. With that loss, the Cruisers finished 3rd in the Region and missed out on an automatic qualification to Nationals. Looking forward, the return of the other two players will make a significant difference in the team’s ability to deal with the press, and also help balance the scoring. The tournament ended with Utah winning the Championship and San Diego in 2nd. James Bohnet was named Tournament MVP and was awarded a trophy that is bigger than he is. 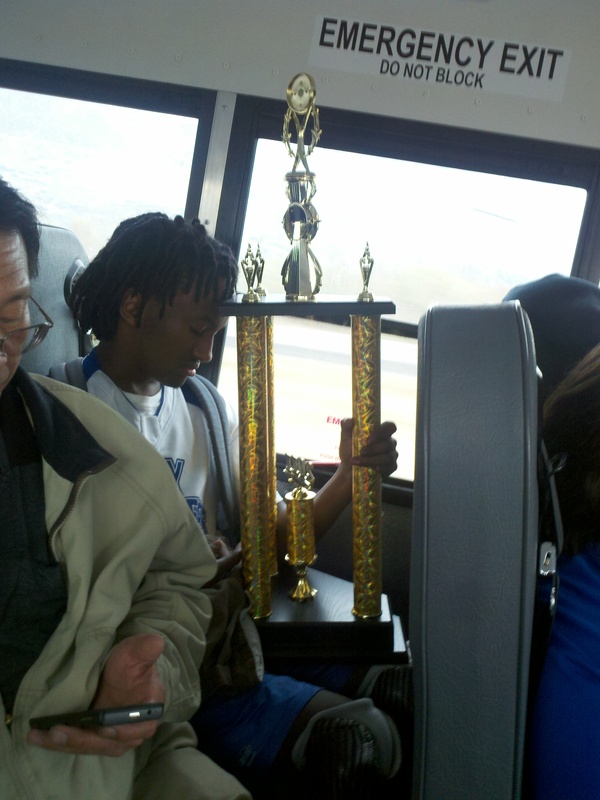 James and his Tournament MVP Trophy! The team is looking so much better than the past two years and it is going to be a great season. Its been a week since I got home and I am almost recovered from the World Cup (and the jet lag and subsequent cold). It was a long (15 days) and demanding trip with a very happy and definitely well deserved World Cup championship for Team USA. Team USA in front of the Eiffel Tower. In the final on November 6, Team USA beat a tough England squad 3-0 to retain their World Cup title from 2007 and become the first USA national soccer team to win consecutive World Championships. The journey for Team USA to the World Cup title featured 2 years of preparations with 7 team training camps and a rigorous individual weekly training schedule. In addition to their training or staff duties each person on Team USA was responsible for raising the money to support their participation. 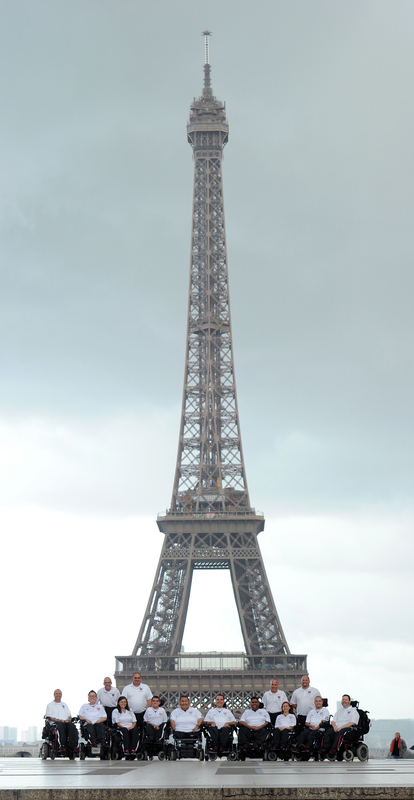 Team USA arrived in France on October 24 for a 6 day training camp (with some occasional tourism). The training sessions were intense and so were several “friendlies” against Team Canada, Team Australia and a top French club team. The team came through these sessions with a powerful sense of unity that stood them in good stead once the World Cup competition started. It seems that there is always a “pool of death” at every World Cup and this was true for this World Cup as well. Pool A, the “death pool” had the USA, Japan, England, Portugal and Switzerland. With only 2 teams from each pool making the semifinals Team USA knew they had to come out strong and have no let-downs to assure a semifinal slot. Team USA’s first match was against Team Japan. An end-to-end duel was won by Team USA 2-0 after a brilliant cross by Cup MVP Michael Archer was tucked into the goal by BORP’s Kendra Scalia-Carrow and another laser strike goal from Archer on a kick-in. Michael Archer and Kendra Scalia-Carrow strategize. The USA- England match was a 40 minute grind as an inspired English team thwarted multiple scoring chances of Team USA and kept a raucous crowd on the edge of their seats. and have to face France (#1 in Pool B) in the semis at 8:00 that evening. In the first semifinal neither England or Belgium (3rd in 2007) could score throughout regulation. Seemingly headed for a shoot-out, The English scored late in the second overtime period and secured their spot in the championship final. 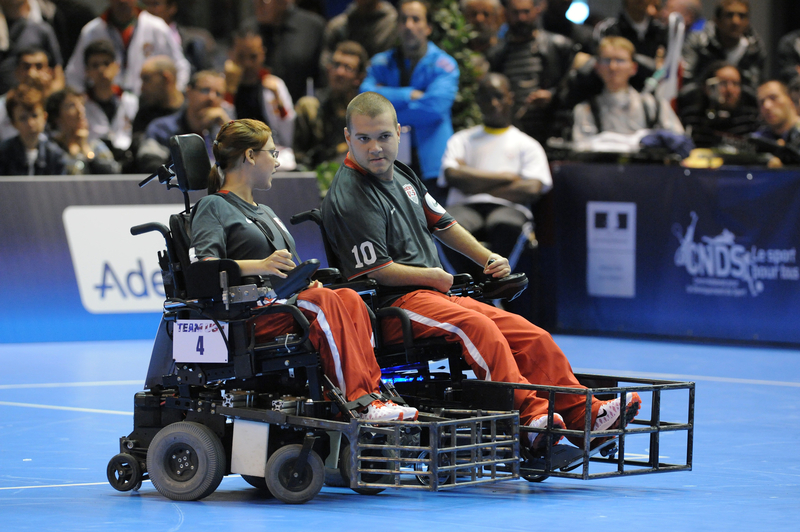 The French team came in to the semifinals with a 4-0 pool play record and the almost total support of a full house home crowd. But a smaller, very vocal and colorfully dressed USA cheering section matched the French fans cheer for cheer. The USA fans had a lot to cheer about as Team USA, behind another brilliant defensive effort, stymied every French offensive foray and scored on a penalty (Archer) and a combination play (assist Scalia-Carrow). A one day break between pool play and finals due to the necessary meetings of the international congress allowed the tension to build around the final. When the Championship match finally started at 3:00 PM the atmosphere was electric and once again the crowd support favored the USA opponent. However Team USA took the air out of the fans about 10 minutes in as Archer scored on a penalty to go up 1-0. England kept the pressure on but couldn’t crack the USA wall and the USA kept their attacking mindset to score 2 more goals for a 3-0 victory and the Cup! 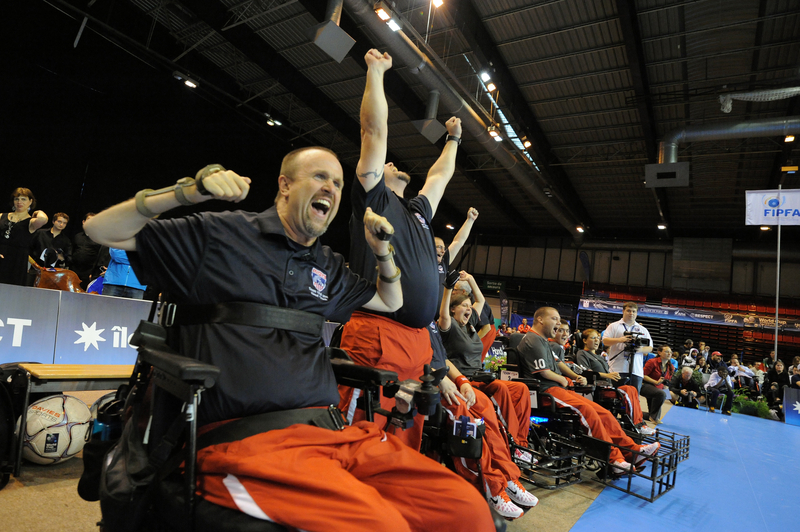 Team USA Coach Chris Finn celebrates the World Cup win. Personal notes: This was my second time around on the Team USA staff. For both campaigns I served as the team referee and rules advisor for training camps. Immediately prior to each Cup I refereed some “friendly” matches and am very thankful to the competing teams and my fellow referees for the opportunity to share a court with them. As both Cups commenced, I shed my USA cap and served on the World Cup Competition Panel which meant maintaining an impartial attitude and little association away from the gym with Team USA (or any of the teams). This was a tiny bit of a strain. However it has been a tremendous honor to be a part of both teams and the Panel, and I cherish the friendships and experiences that we shared along the way (even if some of it had to be quietly and on the inside). I know that every time I have a See’s (butterscotch) lollipop I’ll think of all of you. Support from family, friends and the community was of paramount importance to making these opportunities possible for all of us. My thanks to all of you and especially Dawn and Aya (and Cho-Cho). Special thanks to everyone on both Team USA’s, to BORP, the USPSA, FIPFA and a big “Hoooo!” to Chris Finn for his leadership and friendship.